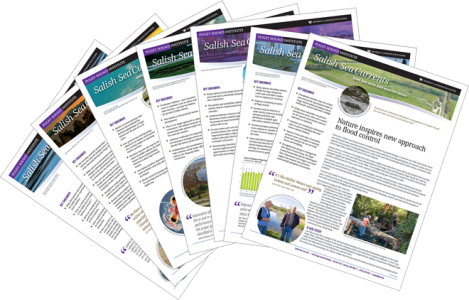 Findings authored this month by University of Washington scientists at the Center for Urban Waters and their collaborators provide new insight into “urban runoff mortality syndrome” affecting Puget Sound coho. Chemicals linked to automobile tires have been found in stormwater associated with the widespread deaths of coho salmon in Puget Sound. The findings were presented this month in the journal Environmental Science & Technology and elevate tires as a prime suspect in “urban runoff mortality syndrome,” a condition that has been endangering coho salmon runs in the region. For nearly two decades, researchers have been mystified by sudden die-offs of coho entering Puget Sound’s urban streams, particularly after it rains. The syndrome is thought to affect more than a third of the coho’s local range and may wipe out some spawning stocks entirely, scientists say. As runoff from rain and snow flows downhill into Puget Sound, it picks up toxic chemicals from roadways and other surfaces. This deadly mixture will kill adult coho salmon within hours of exposure, but scientists have so far been unable to identify which of the potentially thousands of chemicals found in stormwater are lethal to the fish or where they come from. While the authors caution that the findings do not show a definitive link between tires and coho deaths, they report that “the results indicate that [tire wear particles] are an under-appreciated contaminant source in urban watersheds.” They argue that the assessment of tires as a potential source of toxic contaminants should be a research priority. The paper, co-authored by scientists at the University of Washington Center for Urban Waters, identifies a “chemical signature” of tire particles present in water samples where coho mortality was observed [Editor’s note: the Center for Urban Waters is a partner and collaborator with the Puget Sound Institute]. Samples included stormwater runoff from the 520 bridge in Seattle and two other locations around Puget Sound where coho salmon were found dead or dying from exposure to stormwater. Researchers found chemicals from tire wear particles in every sample. Other chemicals from automotive sources such as motor oil, gear oil and antifreeze were also present in smaller numbers, but those from tire wear particles had the clearest chemical signature. Scientists have long suspected vehicles and roadways as a major culprit because the coho deaths most often occur in proximity to roads. The research is part of a collaboration between scientists at the University of Washington, Washington State University, and NOAA. Authors of the paper include UW scientists at the Center for Urban Waters, the Southern California Coastal Water Research Project, NOAA and Washington State University School of the Environment. The study was conducted using a new method of non-targeted screening of stormwater samples through high resolution mass spectrometry conducted at the Center for Urban Waters labs in Tacoma. These sensitive instruments allow scientists to identify hundreds to thousands of chemical compounds at low levels in every sample. Paper co-author Ed Kolodziej of the University of Washington heads the lab where the study was conducted and will continue research into contaminant signatures of stormwater with support from a recent NSF grant. The project includes a collaboration with citizen scientists who will alert project members to salmon die-offs as they are happening. Kolodziej’s team will then collect and analyze water and tissue samples from these sites. While scientists continue their research into identifying the chemical source of urban runoff mortality syndrome, scientists at Washington State University and NOAA have found that a relatively simple mixture of sand and soil can filter out many of the contaminants and can prevent the deadly effect on fish. 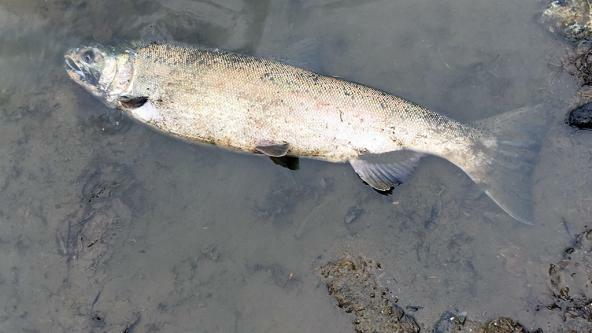 Wildlife managers across the West Coast are hoping to eventually reduce coho deaths through a combination of stormwater filtration and eventually source control.